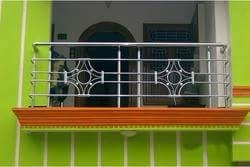 We are manufacturer for stainless steel balcony design and all railing fitting . We are offer our customers a comprehensive range of superior quality Balcony Grills. These grills are fabricated using high-grade raw material obtained from trusted vendors of the industry. With the help of our able engineers these grills are precisely designed so that they can withstand unfavorable weather conditions. Usage: House, Residential Home, Commercial Area, etc. We are offering Fancy SS Balcony Railing to our client. Ss 304 grade stainless steel balcony grills. Installation and finishing charges included in above rate.